The advantage a film like Le Mans—or its predecessor by a few years, Frankenheimer's Grand Prix (1966)—have over these newer films is they were made by racing enthusiasts, men who not only loved driving as a hobby, but also enjoyed watching and following the sport. 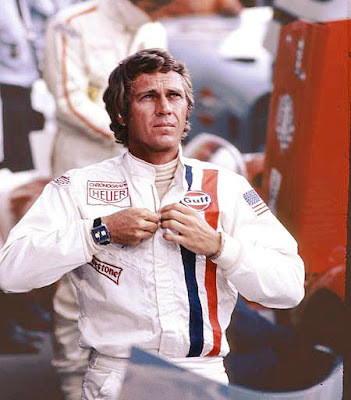 Steve McQueen had started dreaming of fashioning an honest paean to the sport in the early sixties. So dedicated was he to conveying the truth of it that there were many abortive starts and broken relationships (including his friendship with John Sturges, the director that made him a star) left in Le Mans' wake. Say what you will about the behind-the-scenes drama, you really get what makes auto racing so alluring to its boosters in some pretty simple, yet eloquent, visual shorthand. The first half-hour immerses you in the environs of the race track from a multitude of perspectives. From the trailers where the drivers suit up and meditate on the upcoming demands of this 24-hour race to the stands where bored onlookers look at their watches in anticipation, you are there. You're even in the respective minds of McQueen's Michael Delaney and his potential romantic match Lisa Belgeti (Elga Andersen) as they flashback to a fiery crash at last year's race that killed her husband and from which Delaney only barely survived. That's about as much plot as you get before you're plunged into the race proper. The most easily executed yet most exhilarating shot which recurs throughout the race is simply that of the speedway through the windshield from the driver's point-of-view. Another frequent cutaway is from the spectator's angle, a pan from one horizon to the other as cars from Delaney's Team Porsche or the rival Team Ferrari swoosh by. Forget about racing films; none of the running-and-gunning style in contemporary cinema, so often misused by the acolytes-of-Greengrass, can deliver the thrill or immediacy these two examples can without sacrificing coherence in the process. That isn't to say there aren't problems with Le Mans. A studio-imposed plotline eats up a lot of screentime despite its thinness. For once, a star's egotistical sense of rightness should have been heeded. 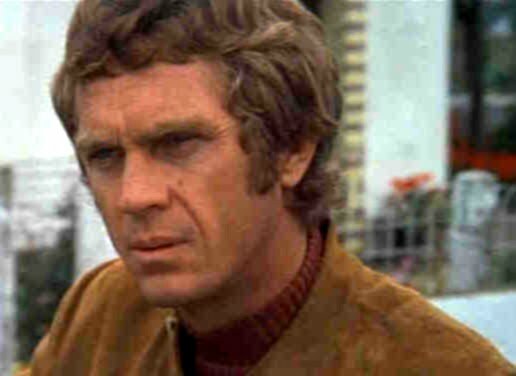 McQueen would have preferred a simple documentary of the endurance race, with him in the driver's seat for one of the cars. For what the film amounts to actually being I can't say I don't agree. But he sacrificed the perfect for the good in order to put his dream up on screen, mirrored metaphorically by his Delaney's winning tactic at the climax of the film. Delaney, determined to beat a longtime rival from Team Ferrari but blocked by another of his team's cars, chooses to get up right behind his teammate's vehicle in order for them to both take advantage of the aerodynamics, ensuring that they take the first two places (even though he comes in second) while leaving his rival behind in third. 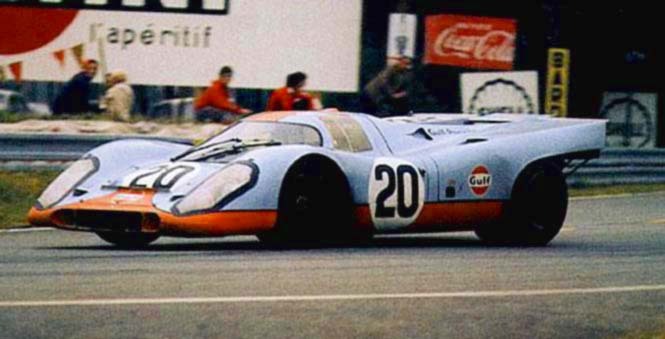 McQueen took one for the team in reel life and real life in order for Le Mans to succeed. And though it met with little praise initially, over time it has garnered new fans with an appreciation for the skills it takes to capture the essence of auto racing onscreen. Not a masterpiece, but an underrated film, that's for sure. I'd forgotten that its climax was stolen by the makers of TALLADEGA NIGHTS. Tony: Thanks so much for contributing to the blog-a-thon. You've nailed what I think is the film's biggest mistake: there's both too little plot and too much. The latter charge seems insane, given the film's reputation, but the movie would have been better off with no plot whatsoever rather than jamming one into the margins here and there. It strikes me that the film's first 35 minutes are Altman-esque, albeit without traditional dialogue. We still get overlapping soundtracks: the p/a announcer, the sounds of the cars, the sounds of fans. It's the kind of operatic cacophony that Altman achieved in Nashville. I love the scene in which, just before the start of the race, McQueen's character shuts his back window, blocking the noise, and all we can here is his steady, intense breathing. 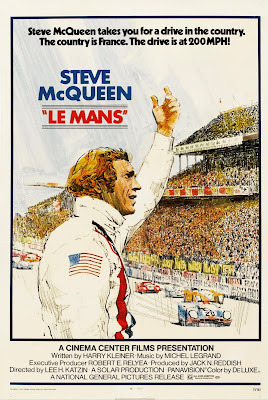 Le Mans isn't anywhere near the top of my favorite McQueen films, in part because the subject doesn't much interest me. But there's some fantastic filmmaking in there, for sure. Thanks for stopping by. I'm going to have to get around to seeing TALLADEGA NIGHTS, which I hear is quite funny. Thanks for hosting such a great blog-a-thon. I actually just think there's too much plot, making LE MANS the first faux-fiction narrative film (there have been plenty of faux-docs) I can remember. I agree with your assessment of the film. 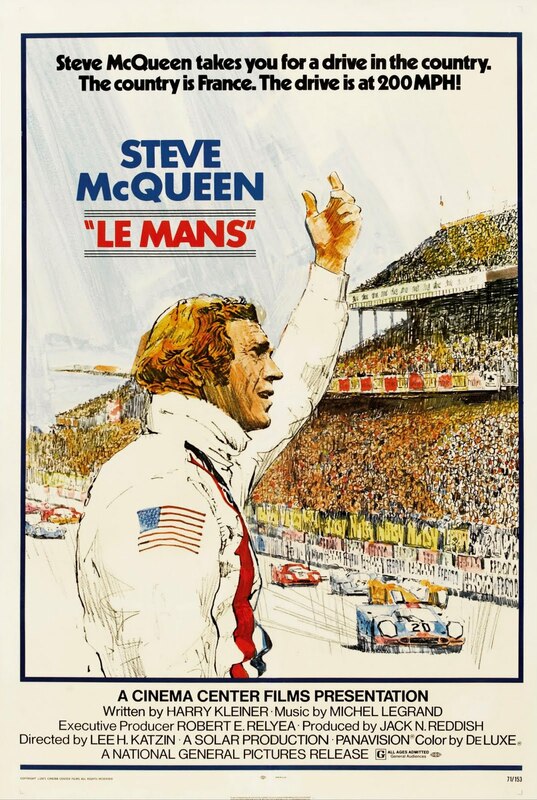 It's nowhere near the best work McQueen has done, but it's a sign of the mediocrity afflicting contemporary films that LE MANS achieves more with a lot less tech wizardry simply by mirroring the enthusiasm of its auteur (which I would argue is McQueen himself). Even though it is completely unrealistic and unabashedly so, I really enjoyed how SPEED RACER conveyed the speed and adrenaline rush of racing. I have not seen LE MANS but notice that it shows up occasionally on Turner Classic Movies. I have to say your post has me intrigued enough to check this one out. Thanks! SPEED RACER is a much-maligned film that I think deserves to be reexamined (Dennis Cozzalio would be ecstatic to hear this). The only reason I ddin't bring it up is because it does include some surreal race tracks that void the comparison to LE MANS in a way that Pixar's CARS doesn't. Off the subject, J.D., you might be interested in a new post I put up comparing BIGGER THAN LIFE to FIRE WALK WITH ME.